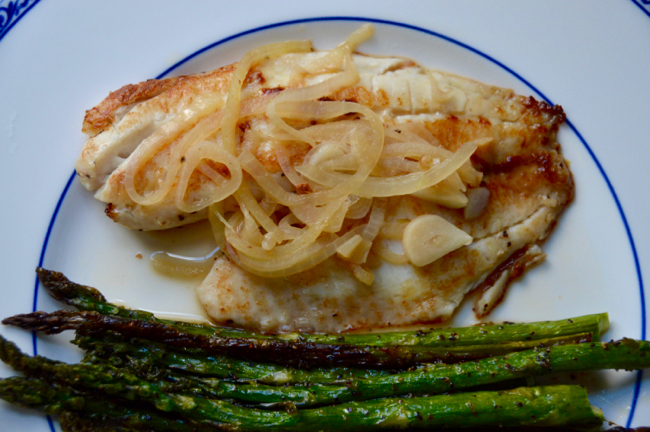 There is nothing quite like a fresh piece of white flakey fish, lightly pan seared in a white wine & butter sauce, served with sautéed shallots and roasted asparagus. Does this not scream spring? I sure think it does! Despite it snowing earlier this week, warm days and clear skies are right around the corner. Over the weekend I had the pleasure of seeing my fiancé Ryan "in action" promoting My Fishing Cape Cod, and meeting members of the community. I have been there since the very beginning of it all, and watching everything come to fruition is the best feeling! Members of the MFCC community (as well as other passionate anglers from all over New England) came together for this weekend-long show. Special thanks to the MSBA for putting on such a great event. I don't think Ryan had more than a minute to himself, everyone wanted to come over and chat! Across the way from Ryan was a booth for High Hook Wines. I ended up talking with the owners of the company, and being the wine lover that I am, ended up with a bottle of red and white to try at home. 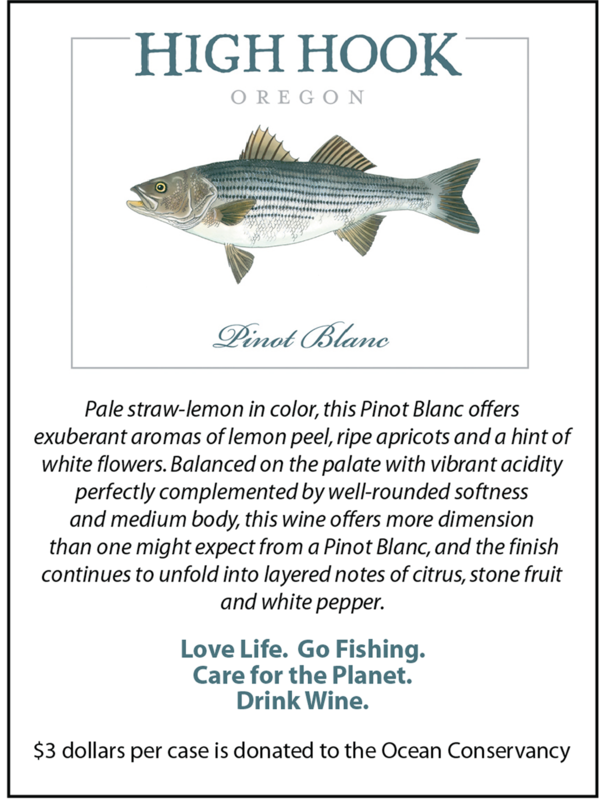 I figured I should not only drink it, but cook with it, to see how the flavors worked in recipes, and there's no better recipe than a fish recipe with white wine. The red wine will be used in a tomato-based sauce tossed with spicy shrimp over linguine. 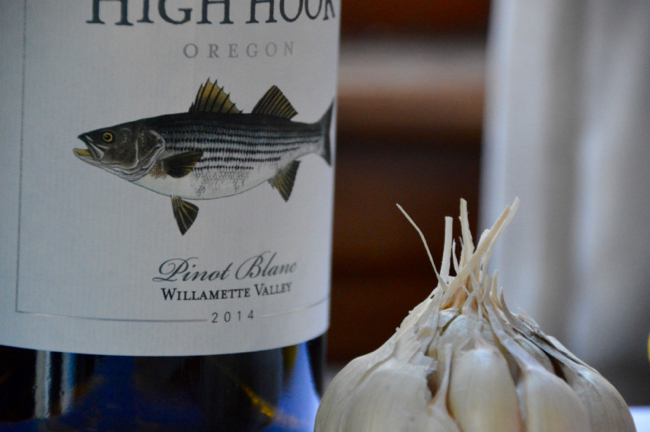 While I was preparing the ingredients, I sipped on the Pinot Blanc and absolutely loved it. There isn't any bite to it (like a pinot grigio) or the sometimes strange aftertaste you can get from a sauvignon blanc. This was a smooth, slightly sweet but not overbearing white, that tasted wonderful. I'm usually a prosecco kind of girl, so regular whites are not really my thing, but this I would order with dinner, no questions asked. As Julia Child once famously said, "I enjoy cooking with wine, sometimes I even put it in the food!" The only things missing here are the salt, pepper, butter, shallots and olive oil, but you get the gist. 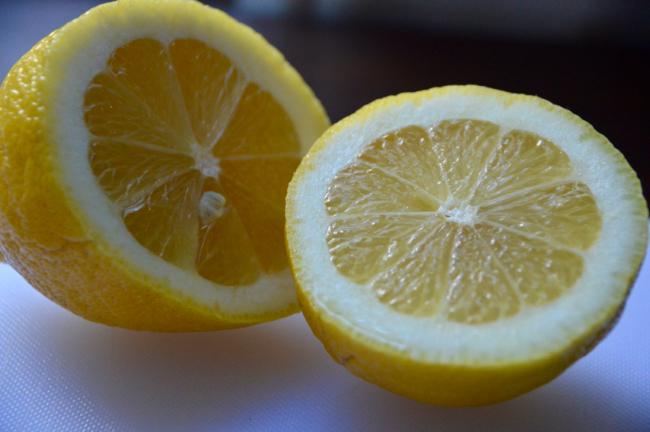 Lemon is such a wonderful flavor to add to a white wine sauce - it gives it the perfect flavor. Helpful tip: Remember that you should always add butter to neutralize the acidity of the wine and lemon - otherwise the flavor could get too overbearing. 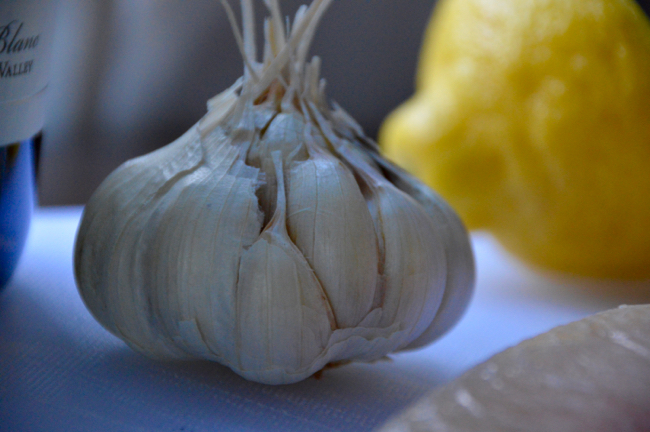 Recently I've been having a lot of trouble buying garlic. I get it home and the inside is either brown or too soft or both - not OK! Now before I buy garlic, I first peel away the outer layers of garlic while at the store, and give the garlic a quick check. I also give a gentle "squeeze test" to ensure freshness. Lesson learned and a handy trick to pass along. I chose tilapia because it was on sale at Whole Foods, but any white flakey fish will do. 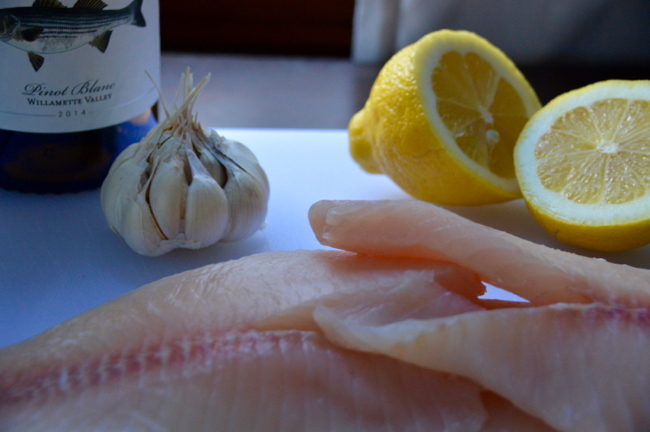 Of course a nice filet of striped bass would be wonderful with this recipe. Make sure to cook the filets in some olive oil, salt and pepper first, to get the right amount of crispiness from the fish. At the end of the recipe you will place the fish back into the pan to allow for some of the sauce to melt right in, but the texture of the crispy edges of the fish are key. All in all, this recipe is a winner. Easy, quick and healthy - what more can you ask for? 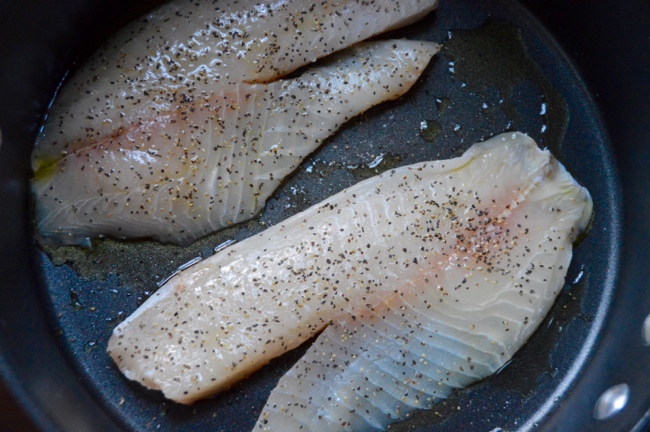 In a pan heated over medium-high heat with 2 tbs olive oil, place the fish filets down and sprinkle with salt and pepper. Sear each side until slightly brown with the edges a little crispy, then set aside. In the same pan, stir in the shallots and garlic, cooking for about 10 minutes or until the shallots have softened. Add in the white wine, letting it simmer for a few minutes, and then add in the butter, lemon juice and chicken stock. Bring to a simmer, letting it cook for about 8-10 minutes, stirring occasionally. Add the fish back in, spooning the sauce over the fish to let it cook in. Serve the fish with a spoonful of sauce and a spoonful of shallot mixture. We love to serve this with roasted asparagus or broccolini. 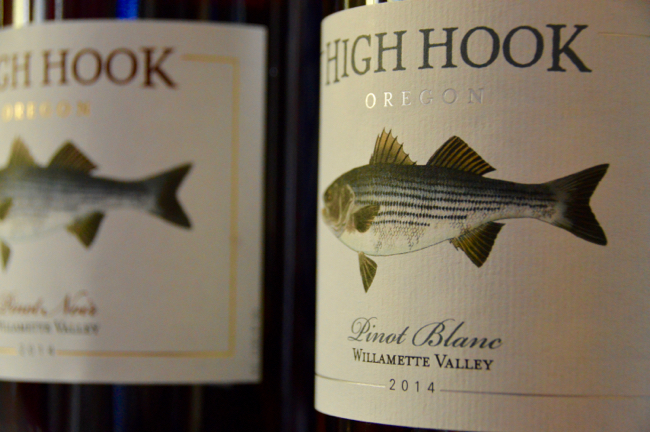 I hope you enjoy and be sure to keep an eye out for High Hook Wines! What do you think? Let me know by commenting below. Hey, Lauren. Great meeting you at the MSBA show. Glad you liked our wines and that you’re cooking with them and enjoying with a meal. I’m starting a recipe page on our website. This will be the first entry. Can’t seem to get around to putting any of mine on there. One of these days…. The wine as well as others including a rose and chardonnay are available at Pioppis liquor in North Plymouth, ma. Talapia scares me a bit. It is usually farm raised, not always bad, but not my first choice. Stuff from China has a bad rep. I would prefer something wild caught. I do love the recipe stuff, especially since you make great stuff simple! We want simple when on the Cape. I completely understand your concerns, Rick. 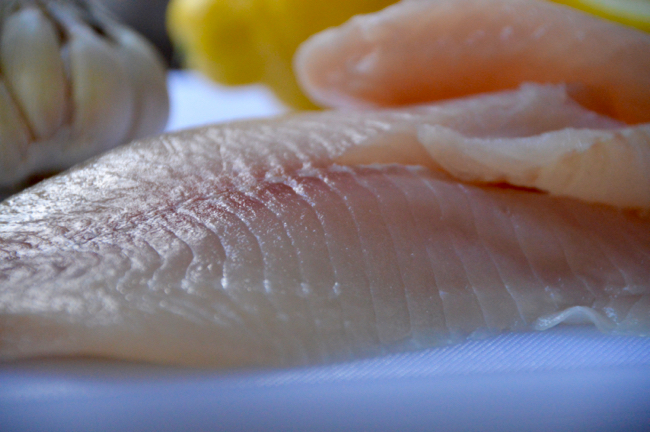 I always shop at either a local seafood place or a Whole Foods for the most sustainably sourced and freshest fish. This particular tilapia did not come from China, however it is farm raised, but being that it still isn’t quite the season for striper around here, this is the most cost-effective fish available at the moment. Try this recipe with a different kind of fish, because any white flakey fish would be perfect with this white wine sauce. Thanks for reading! The meal looks delicious. I have started using tilapia as well. I also talked to the wine guys at the show. They told me that their name “High Hook” originated on Cuttyhunk. The Cuttyhunk Bass Club gave the member with the biggest bass a diamond studded gold pin in the shape of a fish hook. That person was referred to as the “High Hook” and the name became widely used for the person who catches the biggest or most fish. Sound’s tasty! … what do you think for Striper? Please post the Spicy Shrimp recipe … please! I think striper would be great with this! Any white flakey fish will do for this recipe, it just happened to be tilapia that was the freshest (and on sale) at the market that week. Ryan and I ate the spicy shrimp with red sauce dish two nights in a row because it was just so good, so I will definitely be putting that up here soon! Next: Cape Cod Trout Fishing You Can Bank On!